Kitchari is a traditional Indian dish made with a mix of Basmati rice and moong dal. This recipe is simple, easy to make, and one I grew up eating in my mother’s kitchen. It’s gentle on the digestive system and contains healing and detoxifying properties. The texture is creamy, soft, and velvety. What does Kitchari Mean in English? Kitchari means “mixture” or “mess” in Hindi and is pronounced “kitch-uh-ree” with a rolled “r.” In this dish, the beans and rice are “mixed” and cooked together. Kitchari can also be spelled multiple ways, including khichadi or khichdi. I will stick to “kitchari” for this post as that seems to be the most popular spelling these days. In Hindi, we use the word “kitchari” in casual conversation to describe a mess or dramatic situation in our lives. For example, “oh gosh, my life is such a kitchari right now” =). You get the idea! Kitchari (pronouced “kitch-uh-ree”) is one of the most basic dishes in Ayurveda. 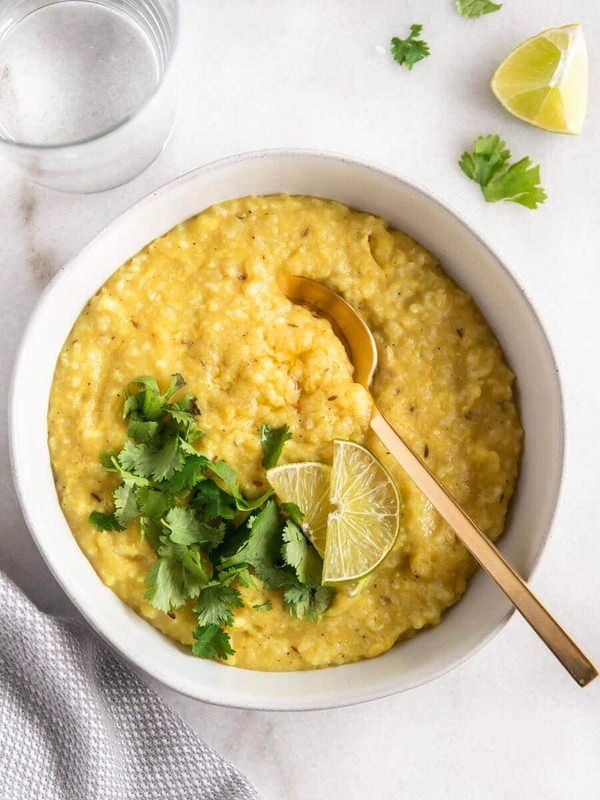 It’s made with a handful of simple ingredients and cooked with a variety of Indian spices, including turmeric, cumin seeds, ginger, and black pepper. 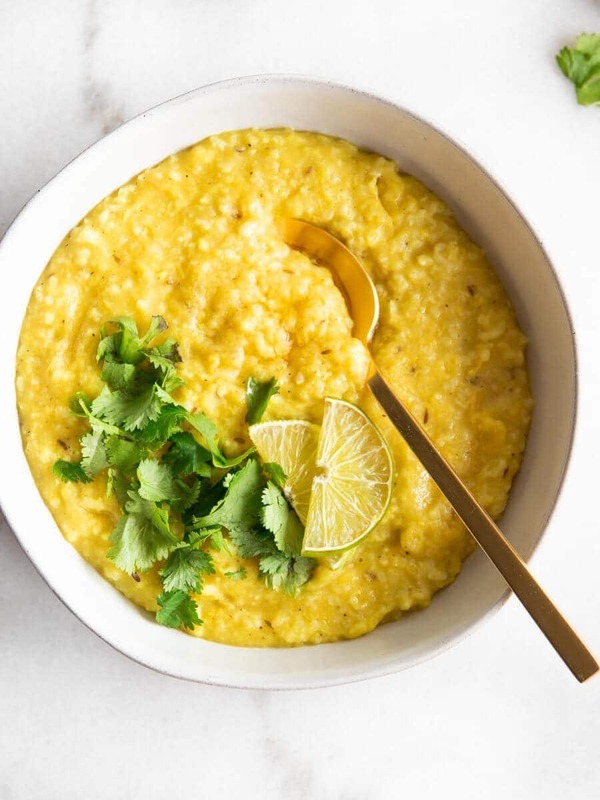 Kitchari’s simplicity can have a balancing and detoxifying effect on the body. 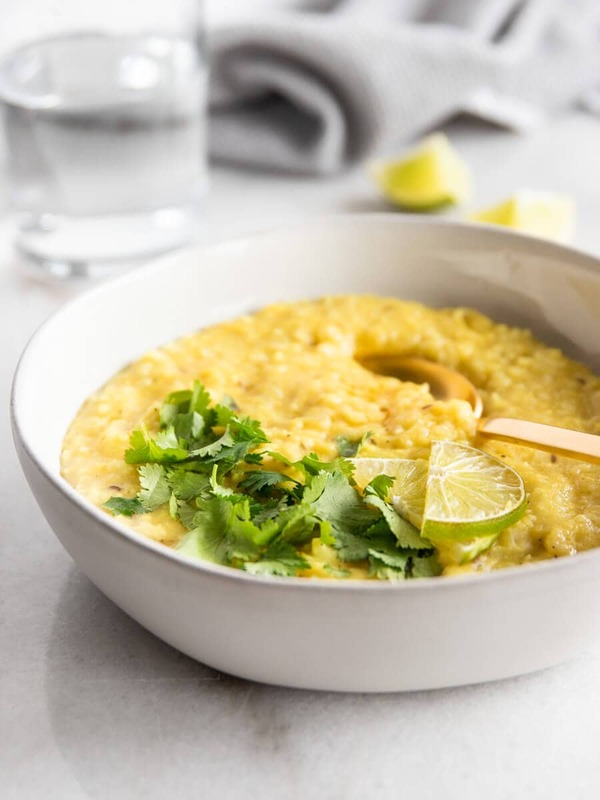 I enjoy it when I’m not feeling well as it’s traditionally prescribed when recovering from illness or when dealing with a digestive or gut issue as kitchari is easy on the digestive system. While kitchari can be made with a variety of beans or lentils, it can be harder for the body to digest. For that reason, Ayurveda recommends using split mung beans, also known as moong dal or washed mung dal. However, it can be a little challenging to find them (I order them from Amazon – I love that they are organic and come from a reliable source). 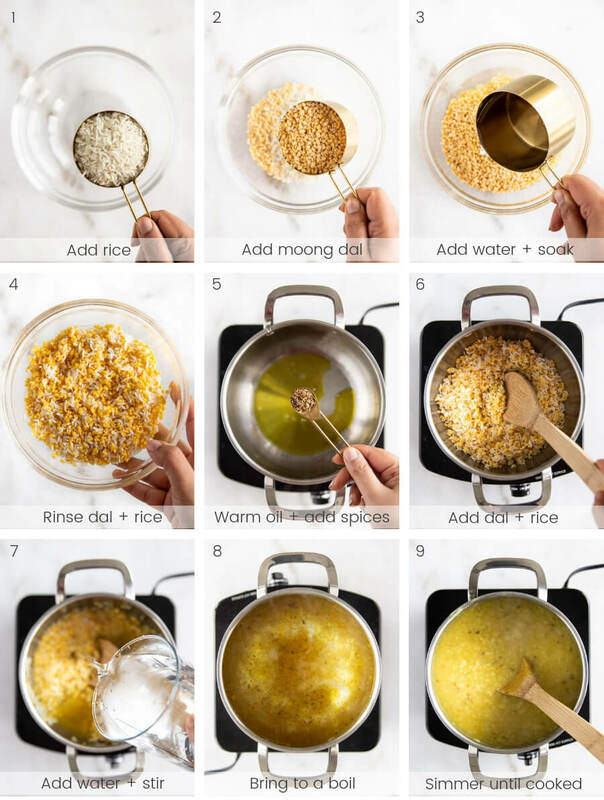 In a medium bowl, combine the rice and moong dal. Ideally, you want to soak the mixture in water for about 15-20 minutes. Pour the mixture into a fine mesh strainer. Rinse under cool running water until the water starts to run clear. Add oil to a medium pot on medium-low heat. Once the oil starts to warm up, carelly add the cumin seeds and let it cook for about a minute until the seeds start to brown and become fragrant. Add the ginger and ground turmeric. Stir and add the rice and moong dal mixture. Season with sea salt and black pepper. Stir and add the 4 cups of water. Increase the heat to medium-high to bring the water to a boil. When the water comes to a boil, turn the heat down to a gentil simmer. Let the kitchari simmer for about 30 minutes, stirring occasionally, until you get a porridge-like consistency. It should be soft and creamy. Carefully (as it will be hot) taste the kitchari to make sure the rice and dal are fully cooked. If not, you may need to let it cook a little longer. Turn off the heat. Adjust the seasoning, if needed, and stir again. Serve and enjoy. Once you’ve made your kitchari, you can either enjoy it immediately or store it for later. If you’re going to store it for later, be sure to cool it down completely before moving it into your refrigerator. I store mine in an air-tight glass container and it’s usually good for up to 3-4 days. Once you are ready to enjoy it again, scoop out the amount of kitchari needed and warm it up on the stovetop in a small pot. Feel free to mix in some water (I usually add 1/4 cup of water for every cup of kitchari I reheat) to get that same creamy consistency you had when you first made it! I hope you enjoy this traditional Indian dish. If you try this recipe, I’d love to hear what you think! Just tag your photos to #realandvibrant on Instagram. There’s truly nothing that inspires me more than seeing you guys trying out the recipes I post. Kitchari is a traditional Indian dish made with a mix of Basmati rice and moong dal. It’s gentle on the digestive system and contains healing and detoxifying properties. The texture is soft, velvety, and creamy. This traditional recipe is simple, easy to make, and one I grew up eating in my mother’s kitchen. Combine the rice and moong dal in a medium bowl. Soak the mixture in water for about 15-20 minutes. Rinse well until the water runs clear and drain. Add oil to a medium pot on medium-low heat. Once the oil starts to warm up, add the cumin seeds and stir for a minute until the seeds start to brown and become fragrant. Moong dal (split mung beans washed) can be challenging to find in most grocery stores. Thankfully, you can buy organic moong dal from Amazon here. This recipe was originally published on March 13, 2017. Since then, it’s been freshened up with new pictures, commentary, and made even more delicious! This recipe looks incredible!! Can’t wait to try it. I’m just unclear on where to use the 4cupw of water? Hi Gila! Thank you for asking — I’ve updated the directions to make it clearer. Hope that helps!! Excited to hear what you think! I made this tonight and it was so delicious! Thanks for shading! Hi Meena! So glad you enjoyed it. This looks so yummy and cozy and calming. 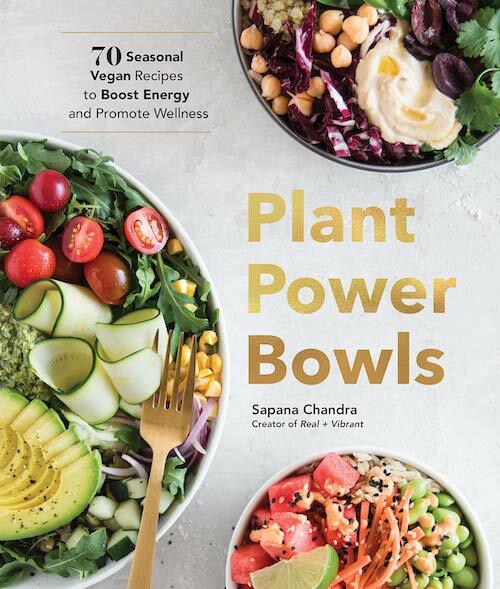 Thank you for sharing this and so many of your beautiful and delicious recipes! Can you share your childhood recipe for Indian Chai? I’d be happy to share my childhood recipe for Indian Chai. I’ve added it to my list of upcoming recipes! I tried this recipe this weekend and it was heavenly. Thank you for sharing your gift with the world! I’m so happy to hear that, Suzy! So glad you enjoyed it! So delicious. I added corn because I some left over and it’s so so good. I’m so happy you enjoyed it, Lizette! Corn sounds like a delicious addition! What are the nutritional values of this recipe? Hi Brie, I’m working on adding the nutritional values for all of my recipes. Stay tuned and thank you for your feedback.